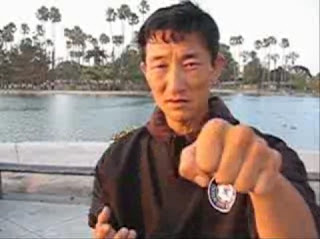 My Chen Pan-Ling brother and good friend Mark Small sent me a link to the Camp Tai Chi site run by John Crewdson. John's home page has the intriguing heading "7 Ways Tai Chi is Different From Yoga". I don't disagree with any of John's points, particularly his observation that taiji (tai chi) is a martial art, where yoga is not. But I can't help thinking there is much more to the distinction between these 2 disciplines, particularly since taiji is very rarely practised as a combat art. Rather it is seen as health and well-being discipline not unlike yoga. 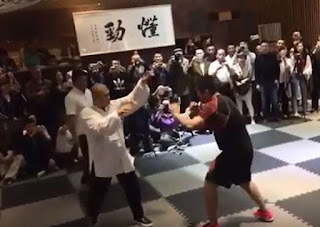 Despite their common objectives, it is my view that yoga and taijiquan are so different in function that in many respects the question of "how they are different" is misconceived. Arguably the impression that taiji and yoga are similar activities is fostered by the fact that "new age" adherents often lump them together as both "spiritual" and "physical" disciplines. Put another way, both are seen as a physical medium by which one can attain spiritual enlightenment, peace of mind or insight. They are seen as a means of "unifying mind and body". I have previously referred to my disdain for Cartesian or other "dualism" - ie. the notion that there is a separate "mind" or "spirit" on one hand and a "body" on the other.1 In my opinion philosophers like Gilbert Ryle were quite correct to ridicule Rene Descartes' dualism as a "ghost in the machine".2 I think it really is incontrovertible that we are one unit; not a machine for a "spirit" to inhabit, then leave. As I've said elsewhere, everything that happens to us, every thought process, every emotion, every memory, every impulse, can all be traced to an electrochemical process that occurs inside your body. It might well be convenient to speak in dualistic terms in particular circumstances (eg. we might well speak of "psychological factors" knowing full well that all such factors are also physiological) however in the end we must be aware that such dualities are merely fictions. They are fictions in much the same way as the law has "legal fictions". For example, a corporation is regarded in law as a "person"; to the extent possible/necessary it has the same rights and liabilities as an individual. Yet we know it is not a "person" in a literal sense. Laws have traditionally created such fictions by using words like "deem" (eg. a person who is under the age of 16 is deemed not to have the capacity to consent to sexual relations; and a person who has sexual relations with a person under the age of 16 is deemed to have sexually assaulted him/her). Fictions might be necessary or convenient for daily discourse - be it social or legal. But they are fictions nonetheless. Most "new age" followers cling to the notion of a duality while paradoxically acknowledging its fiction. They speak of bringing the "mind and body into harmony" while the very philosophies they purport to follow dictate that such a duality is illusory to begin with. If anything, it is this underlying philosophy of "unity" that links the practise of taiji and yoga. Yoga has its philosophical roots in Hindu thought and is derived from the sanskrit word "to yolk" or "to unite". The latter is a reference to the concept man and "the divine" are one. In other words, not only are mind and body united, they are also indivisible from the universe - and the practise of yoga can lead to this realisation. "Dualities are a product of "Maya" (illusion caused by the mind's preferences prejudices). The mind sees the division but fails to see the unity. It becomes man's destiny to realize Brahman... the spark of Brahman contained in all (called the "Atma"). Once the Atma is realized as man's essential reality, man will penetrate the veil of Maya and realize the Unity within diversity... Hatha Yoga is a system of preparing and purifying the physical body in order to create a better vehicle with which to gain realization of the Brahman." In fact, you will note that even the "taiji" - the traditional symbol of the yin and yang - comprises 2 halves that not only "swim" into one another, but even have a small element of the other within their body (represented by 2 small circles of the opposite colour). This depicts the Daoist concept that the dualism exists only temporally. It is fleeting or transient, existing like a snapshot of a flowing river, but not otherwise. "These two cardinal principles of existence are then symbolized in the two fundamental hexagrams of the Book of Changes, the CREATIVE and THE RECEPTIVE. In the last analysis, this cannot be called a dualism. The two principles are united by a relation based on homogeneity." So it is true that both yoga and taijiquan are both based on a unitarian philosophy; one that describes dualities as either an illusion or merely the view from a transient perspective. We know some of this intellectually: we aren't surprised to hear about corporate executives dying from over-work and stress, or that a caged tiger's lifespan is shorter than that of one which is able to wander in a more natural enclosure. However we somehow don't quite "get it" until we see both the "psychological" as well as "physical" fruits of activities such as yoga and taiji, eg. a lighter, more contented mood, extra energy, improved blood circulation, greater bowel regularity, you name it. Doctors keep telling us to keep fit for all these reasons. We know that those who suffer depression feel better when they exercise. 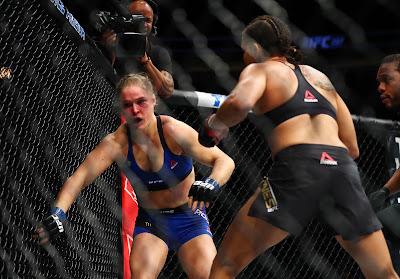 We know that those who are suffering stress feel better after hitting a punch bag. In the case of the latter, it won't be because they have "vented their frustrations" on the bag. Rather it will be because they have had a chance to forget their frustrations through a vigorous physical activity. Pounding a bag and imagining it is your boss is likely to leave you even more "worked up" when you finish. The best stress-relieving exercise is one that takes your mind as far from the source of your frustration as possible. Both yoga and taiji are especially well suited to stress relief because they require concentration; the kind of concentration that takes your mind away from your worries. When you run/jog/cycle/swim you can still think about your problems. If you play a game of football or tennis you can still encounter frustrations that come with competition. In yoga and taiji there is no opponent but yourself. Yet how do I reconcile this with my opening remarks that taiji and yoga are fundamentally different? The answer lies in how the 2 disciplines function. Yoga and taiji might indeed foster the same goals. Both aim for the same summit. But they start on opposite sides of the mountain. They might have the same objective, but in terms of their function (ie. how they achieve that objective) they are as different as surfing and cricket. Why do I say this? Surely both require the solo6, 7 perfection of certain physical exercises? 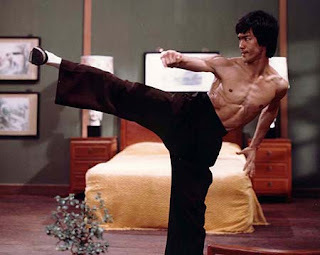 Once again I will address this by referring to the Yi Jing - the Book of Changes. Taiji is about the process of change; it manifests as a series of movements that flow like the water in a river. There are no pauses, only a continuum. Taiji might be examined by reference to certain fixed points, but only for convenience of learning. Like the water in a river, any position in a taiji form is transient. In short, the function of taiji lies in the process of change or transition from "posture" to "posture" - not in the "postures" themselves. I have put the term "posture" in quotes because there are in fact no postures in taiji. You might be familiar with certain "trademark" images of taiji - eg. the end of the "single whip" sequence or the middle of the "snake creeps through grass" sequence. You might be forgiven for thinking that these are "postures". However these are snapshots of a continuum; ie. they are points through which the body passes without pausing. Because the movement in taiji is often very slow,8 you might sometimes be forgiven for thinking that there is a pause at a particular point. But if you look closely, the flow of movement is constant. "One of the hallmarks of a good calligrapher is that there is absolutely no hesitation while the brush is in motion - which you were able to witness, it seems. I have read that you can see the difference between an expert and a novice when you look at their work through a microscope. It has to do with how the microscopic particles of ink lay on the paper and line up smoothly. The impression we have at the macro level exists because of a real difference at the micro level." Yoga practice, in its typical Hatha manifestation as a system of physical exercise,7 takes the form of a series of postures called "asanas". It is true that one posture can flow into the next: the series known as the "salutation to the sun" provides an apposite example. However the function of the yoga lies not in the transition. Rather, yoga focusses on the postures (asanas) themselves. The movement from posture to posture is important and controlled, however it is a means to another posture. "Hatha yoga has many static postures and there are slight rest periods in between one posture and another. 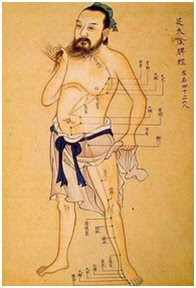 These rests are required because the body has been taxed by the nature of holding the particular posture. 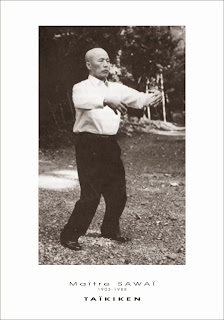 Tai Chi Chuan is continuous and the body does not need to rest because postures flow too quickly to tire the body." 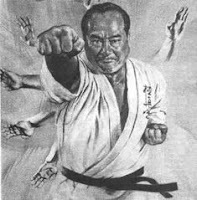 I have had some yoga practitioners approach me to learn taiji only to express their disappointment in relation to the art. In some cases I could see that they had misapprehended its purpose; they insisted on seeing it as a string of postures. The "string" was ultimately far more complex sequentially than what they were used to, yet the "postures" themselves did not seem as challenging. 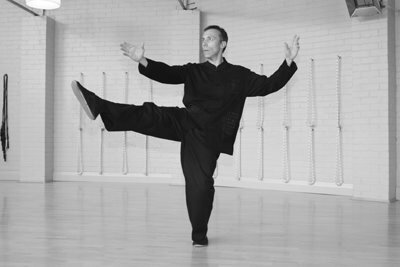 Looked at in this light, taijiquan might then be misinterpreted as an inadequate form of yoga with pointlessly complex choreography. I've found this criticism particularly among those who practise one of the "flow yoga" variants that are becoming popular. These are highly functional and laudible forms of exercise, but they remain essentially a subset of yoga - not taiji. The "flow" one employs in moving from one asana to another (or within an asana) is very different to the type of "flow" one employs in taiji. For a yoga practitioner to appreciate the taiji concept of "flow" they need to let go once and for all the notion of a "posture" in taiji. They need to understand that the goal of taiji is not to attain and hold a posture, but to attain a particular quality of movement; a continuous flow analogous to the brush stroke of a master calligrapher. This is a very subtle concept that is "poles apart" from the perspective of a yogi (yoga practitioner). Clearly criticisms of taiji as a "poor man's yoga" are as flawed as a taiji practitioner saying that yoga is a "poor man's taiji". "Flow" in a taiji sense is not relevant to a yoga asana, and any attempt to denigrate yoga as "too static" misapprehends its function entirely. Both taiji and yoga are superb forms of exercise. Their differences don't mean they are antagonistic; rather the differences accentuate the fact that they are complementary. 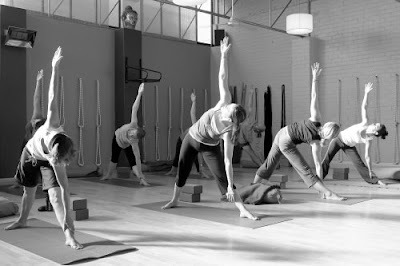 I've often thought that the ideal combination of exercise for health and well-being is yoga and taiji. It is worth noting that many taiji practitioners practise static "qi gong" postures, just as yogis often practise "flow" forms. Perhaps this is because both seek to augment their practise with the strengths of another, opposite discipline. To me, taiji and yoga are an archetypal manifestation of yin and yang; two opposites swirling around and into one another; a functional duality that, in goal, ultimately coalesces into one. 1. The notion of a "trialism" comprising mind, body AND spirt as separate concepts is even more absurd and one that I'm going to ignore. 2. Ryle, Gilbert. The Concept of Mind. Chicago. University of Chicago Press. 1984. 3. Galante, Lawrence. 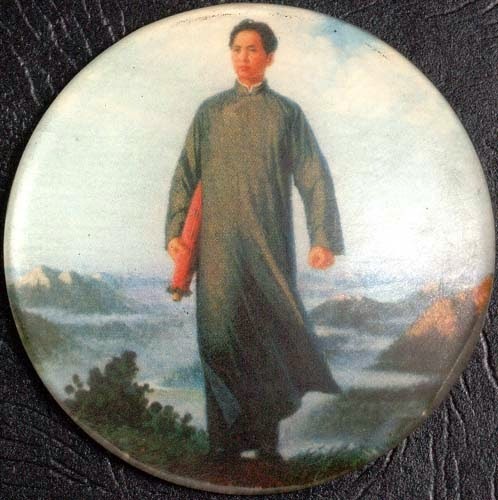 Tai Chi: The Supreme Ultimate. York Beach, Maine. Samuel Weiser. 1981. 4. 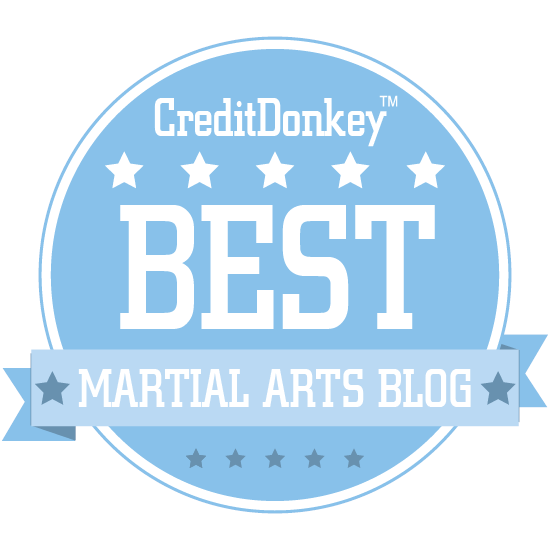 See chapters 1, 25 and 34 of any translation of the Dao De Jing and note this article. 5. Wilhelm, Richard (trans. Baynes, Carey F). The I Ching or Book of Changes. Princeton, N.J. Princeton University Press 1977. 6. Taiji does have partner work, but we'll leave that out of the equation for the time being. 7. 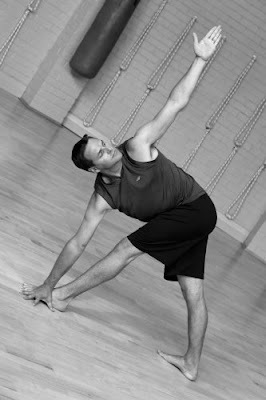 When I refer to yoga exercises I'm referring to what is known as "Hatha" yoga which is a physical discipline. There are other, purely medidative, yoga disciplines such as Sahaja or Kundalini Yoga. 9. In my opinion, labels like "qi" or "prana" are traditional paradigms quite like the "yin and yang" duality. They were created to enable a discourse or description. They are, at best, inaccurate and, at worst, entirely fictional. However this does not mean that they are functionless. I see labels like "qi" and "prana" as temporal; they change their meaning depending on the context. When taiji practitioners speak of "qi" they sometimes mean "momentum". In other cases they mean "intent". Sometimes they mean concepts known in physics as "force", "impulse", "work", "power" and, yes, even the oft-misused "energy". Ditto with "prana" when used by a yogi. Such "flexible" or "temporal" labels were probably more useful in the pre-scientific world in which yoga and taiji were developed but some still find them useful in terms of relating or visualising an experience relevant to their discipline. I'll take a look at those books - thanks for the tip. Wow that was very interesting. Dan your name sounds very familiar to me - did/do you work for the Department of Justice? I worked for the DPP then went to the Supreme Court to work for the Judges. If it's the same you, I've sent you a friend request through FB. 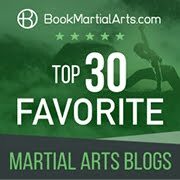 I have trained in karate for the last 7 years (except the last 2 after my 2nd child was born) so have an interest in these things. Cheers, Esther Nilson.